September 26, 1982: Knight Rider debuted on NBC with a 2-hour movie! 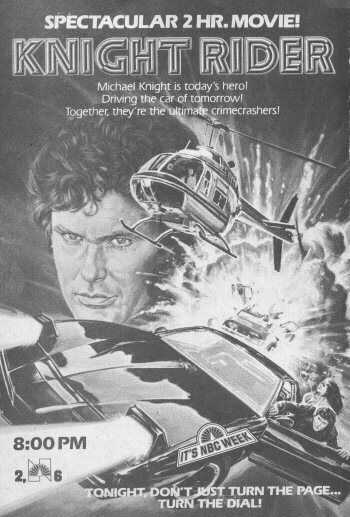 Starring David Hasselhoff and Edward Mulhare, the pilot episode (subsequently renamed Knight of the Phoenix in syndication) told the story of Michael Long, a police lieutenant who is ambushed while trying to bust a gang of industrial spies. He is given a new face, a new name (Michael Knight), and a new car: the Knight 2000 – a virtually indestructible machine that is the fastest, safest and strongest set of wheels in the world, and houses an AI named K.I.T.T. (Knight Industries Two Thousand). Together, Knight and his car set off to finish what Michael Long started, and prove the one man can make a difference! Brandon Tartikoff, then Head of Programming at NBC, told California magazine that the show was borne out of a conversation he had with one of his assistants about casting handsome leading men who couldn’t act. They imagined a series called The Man of Six Words, which would begin with the hero climbing out of a woman’s bed saying “Thank you.” Then he would chase down the bad guys and shout “Freeze!” Finally the victims would thank him and he would reply, “You’re welcome.” In between, the car would do the talking. In reality, NBC had been looking at producing a “car show” for some time, in part to compete with CBS’ The Dukes of Hazzard but also thanks to a successful episode of BJ and the Bear about a futuristic police car. The project was shopped all around Hollywood before eventually landing in the lap of producer Glen A. Larson, who got a handle on the concept by modernising the classic Lone Ranger Western format. Actors Don Johnson and Steven Bauer screentested for the role of Michael Knight along with future guest stars Jeffrey Osterhage (K.I.T.T. Vs K.A.R.R.) and Phil Coccioletti (Slammin’ Sammy’s Stunt Show Spectacular), but it was former soap star David Hasselhoff that walked (or should that be ‘drove’?) off with the role after a chance encounter with Tartikoff on an airplane. Hasselhoff blew his first screentest from nerves, but pulled himself together with positive thinking and won the role – particularly due to his treatment of patting the car like a horse and calling it “buddy,” all in keeping with the Lone Ranger style. The pilot went before the cameras in a hurry, with several key scenes being filmed for a presentation for NBC executives. In an attempt to make it “Network Proof,” Larson called in favours from friends and cast Richard Anderson, Vince Edwards, Charles Napier, John Quade and Richard Basehart in supporting roles, . Edward Mulhare and William Daniels rounded out the cast as Knight’s boss Devon and the voice of K.I.T.T. respectively. Upon seeing the presentation-form abbreviated version of the pilot episode, the executives immediately passed a series order, and the show rode out 90 hours across four years. The concept has been popular enough to spawn two movies of the week (a reunion movie, Knight Rider 2000, 1991, NBC; and a futuristic reboot, Knight Rider 2010, 1994), and two spin-off TV series (Team Knight Rider, 1997-98, syndicated; and Knight Rider, 2008-09, NBC). A feature film is currently in development. This entry was posted in Anniversary, Knight Rider, Original Series and tagged Brandon Tartikoff, Charles Napier, David Hasselhoff, Don Johnson, Edward Mulhare, Jeffrey Osterhage, John Quade, NBC, Phil Coccioletti, Richard Anderson, Richard Basehart, Steven Bauer, Vince Edwards, William Daniels. Bookmark the permalink.